Over the past few years, K9 Magazine has, we admit, had a little fun at the expense of the hysteria obsessed culture surrounding certain types of dogs. Two stories in particular seemed to, rather sadly, prove our point - that if you scream and shout a lot and whip people in to a frenzy, all rational thought can rapidly dissipate. For those who missed it, we thought it would be a good time to re-wind the stories of the Montauk monster and the Gollum creature. In both incidents, we (blatantly) parodied the reporting of these two animals deaths in much the same way as tabloid media often likes to characterise Pit Bull type dogs. The most maligned dog breed of all time has suffered a terrible press and it seems that people will, genuinely, buy just about anything that is written about the breed if it happens to match their own personal stereotype. Our Montauk Monster and Gollum creature coverage was done, very firmly, with tongue in cheek - but, you know what? Some people STILL bought it! Petrified locals in a South American town are said to be living in fear today after a ‘monster’ crawled out of a lake. The creature has been described as something out of Lord of the Rings, more worryingly though, it is said to have ‘charged’ local school children. Professional Pit Bull identification hexperts have claimed that the animal is “almost certainly a Pit Bull”. Our source told us; “It’s not a perfect Pit Bull, but it’s a Pit Bull all right. You can tell by looking at the jaw.”The monster has struck fear and confusion in to the small, quiet town of Cerro Azul, Panama (which was busy minding its own business) – was first seen on Saturday when some local teenagers were playing by the water. They reportedly “screamed” when the five-foot (possibly eight-foot, teenagers tend to understate things when they’re speaking to news reporters, it’s probably at least ten-feet) creature emerged from a cave and started clambouring over rocks towards them “as if to attack them”. The beast is said to be ’slimy’ and contained ‘an evil look in its eye’, but this is – it has to be stated – merely speculative. Locals who encountered the horror hound had to make a desperate attempt to defend themselves against the monster and resorted to ‘throwing rocks at it’, signalling the undeniable intelligence of man versus the repugnant horror and sickness of nature’s monsters (like Pit Bulls). The youngsters who had encountered the devil dog told their parents about their ordeal but were not believed until the adults went to the shore to see the creature for themselves. The incident conjures up memories of the ‘Montauk Monster‘, also believed to be a Pit Bull (but not a perfect one). Some have speculated that it’s an alien. Others have said it could be the result of animal genetic experimentation gone awry. 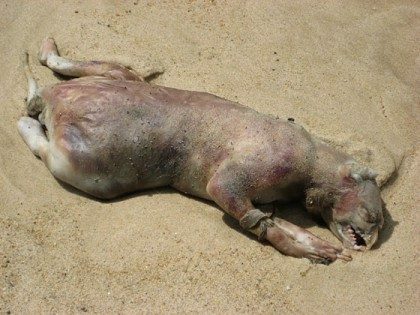 But one of the latest theories put forward is that the so-called Montauk Monster might even be a Pit Bull. Eye witnesses who have seen the carcass up close, first hand, have said that it looks most like a pig, despite the obvious anomolies with head/snout structure. Now speculation is abound that the animal could be a dog, specifically a Pit Bull that had drowned and washed up on the beach. Further speculation has suggested the body is part of a publicity stunt, but for what, nobody knows at present. Further to the news this morning that a prominent UK breed ID expert officially ruled out the Montauk monster being a Pit Bull type dog, another leading Pit Bull spotter has stepped forward to sensationally claim that the animal could and indeed probably IS a Pit Bull! The new breed ID expert claims to be more experienced and didn’t obtain her qualification on a four hour course. The latest expert to comment is an experienced Dangerous Dogs Act breed ID expert who holds no four hour ID course qualification, she holds no qualification at all. But she does have many years experience which she says helps her to ‘know a pit bull when she sees one’. We quizzed her on what she meant by ‘perfect pit bull’ given the fact that they are, to all intents and purposes a cross breed by definition – certainly here in the UK. Mommy often says…Adopt…dont purchase! I’m happy a person is hoping to aid my k9 cousins!